Warning for those who like buy new pc with pre-installed Windows 7 or Windows 8.1, you have only 1 year left because Microsoft is planning to end the sales of Windows 7 and Windows 8.1 by the end of next year. 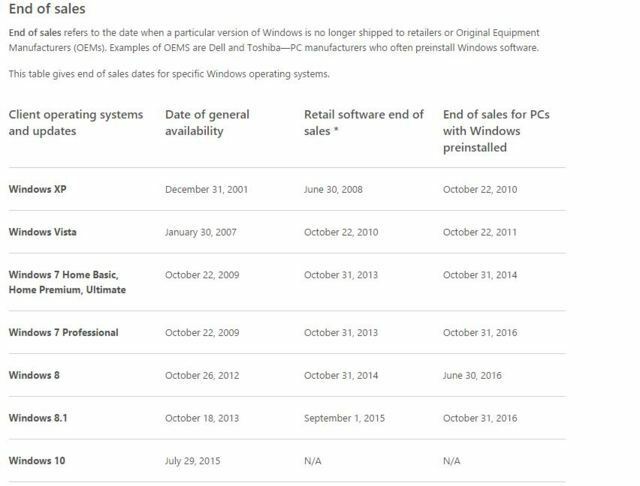 Microsoft has updated its “Windows lifecycle fact sheet” that outlines the product sales periods for all its desktop operating systems. It has set a date of 31st October for Windows 7 to be completely killed off. After that date, the only choice for consumers will be to purchase new computers with Windows 10 installed. Microsoft has stated it will allow anyone with a genuine Windows 7 or Windows 8 copy to upgrade to Windows 10 for free. However, this grace period ceases at the end of July next year, with Windows 10 having been launched at the end of July this year. So, if you buy a Windows 7-based PC in August 2016, chances are you won’t be eligible for the free upgrade.Last week Microsoft revealed plans to move the Windows 10 upgrade that shows up in Windows Update into the “recommended updates” section next year. That means that customers running genuine copies of Windows 7 or Windows 8.1 with fully automatic updates enabled may see their computers switch over to Windows 10 without any user input. Since Microsoft already killed Windows 7 and Windows 8.1 by ceasing with retail availability in October 2013 and September 2015 respectively. However, extended support for Windows 7 will stop in January 2020, whereas for Windows 8 its January 2023. Microsoft aims to have 1 billion devices running Windows 10 globally. Last month, the company revealed that there are 110 million devices now running the operating system, while the October market share figures by Netmarketshare shows Windows 10 has 7.94 percent of the marketplace. Windows 7, still in the lead, holds 55.71 percent.